I meant to be done with the do-overs by now, but I keep falling asleep around 10:00 PM lately. Thus, no sewing time. Not a big deal, though. 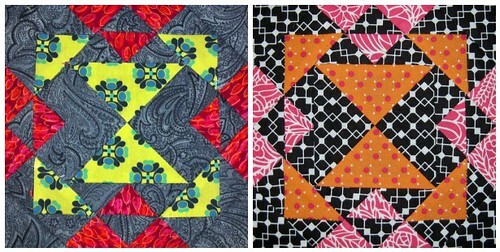 I got three more done on Friday, which leaves me with four more blocks. I’m hoping I can crank those out this afternoon. I was actually very happy with the first iteration of Weathervane. Unfortunately, when I ironed this block, the white print picked up some black residue, delineating the seams. So, into the re-do pile it went. Very happy with the second version. 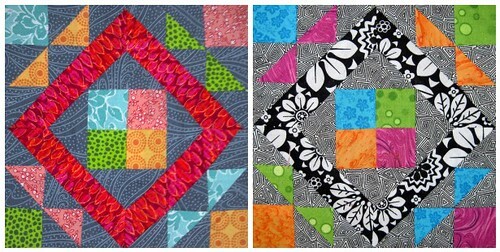 I decided to use some AMH, paired with a couple of Joann’s fabrics. At this point, I’m not going to use white in any of the remaining blocks – I have enough ‘white and bright’ blocks for the rest of the top. This is another block with which I was very happy. 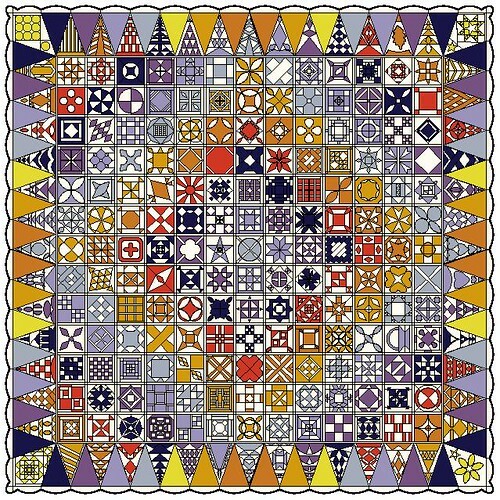 Unfortunately, I failed to print the paper piecing templates out at the correct size, meaning I forgot to turn scaling for paper size off. Regardless, I’m actually much happier with the new block. The colors are richer and the grey balances them well. 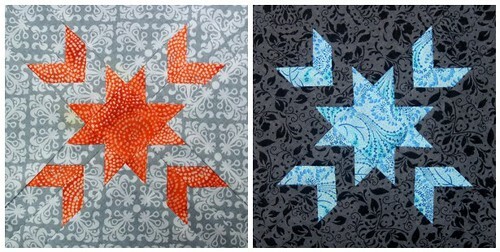 Separately, I love all three prints that I used in the first version of Wood Lily. Too bad for me that the scale and shading of the purple print is far to close to that of the black background print, and it disappears a bit. Enter another do-over, lol. I’d somehow forgotten that I had that black print in my stash – I think because it wasn’t stored with the bulk of my stash. It was in a pile of washed fabrics that I’d never gotten around to ironing and folding once they were out of the dryer. 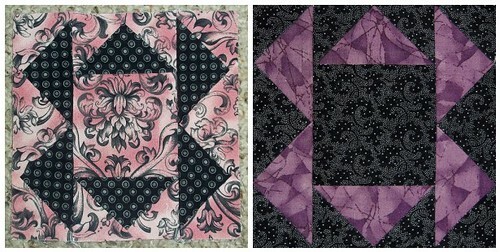 I cannot truly express how excited I am to be so close to being done with the Farmer’s Wife Sampler blocks! 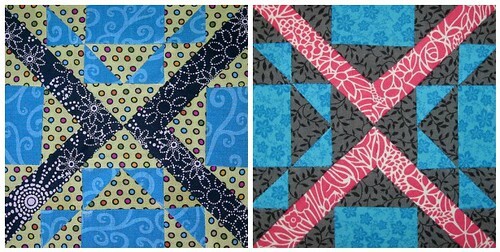 According to Flickr, I posted my first blocks on June 20, 2011. It’s been approximately 21 months in the making so far, though there was a six month or so hiatus from the project because I am occasionally really, really stupid, and ‘lost’ eleven blocks when I really hadn’t. 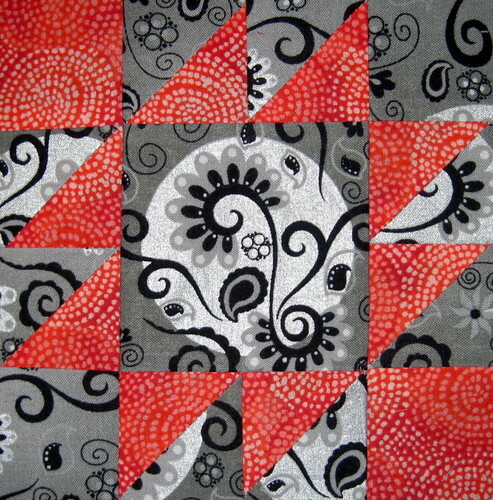 I’m so very ready to move on, and am eagerly awaiting fabric to finish the settings. 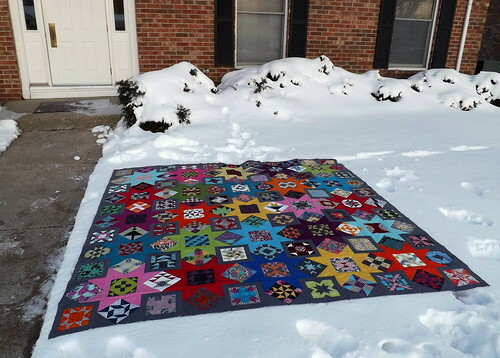 After that, I can begin the adventure of quilting the thing. 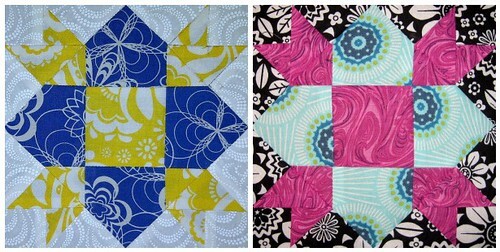 I’m sure I’ll be ready to hang myself for being silly enough to want to do the quilting myself, but ah, well. That’s right! 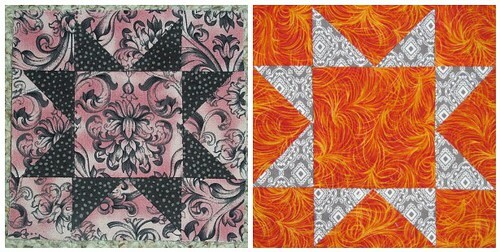 It’s the Dear Jane Sampler. And, yes, I know I’m completely insane. 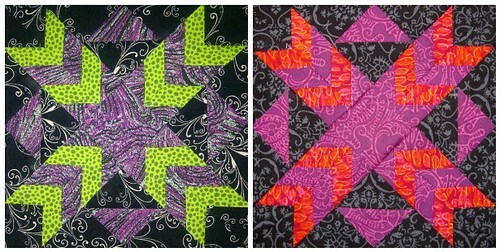 I bought the fabrics a couple of years ago, and finally picked up the the Electric Quilt Company software, so I’m ready to go! 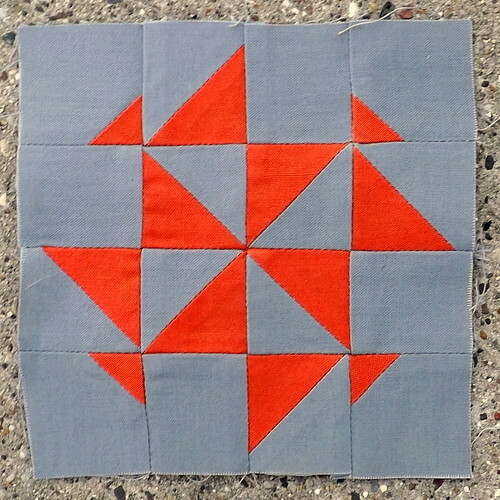 I have a feeling I’ll end up re-drafting a couple of blocks, as I noticed that the software’s drafting seemed counter-intuitive to easier piecing or simplified applique. No matter though! I’m excited to get too work on Jane, and will be starting this weekend, if all goes well. 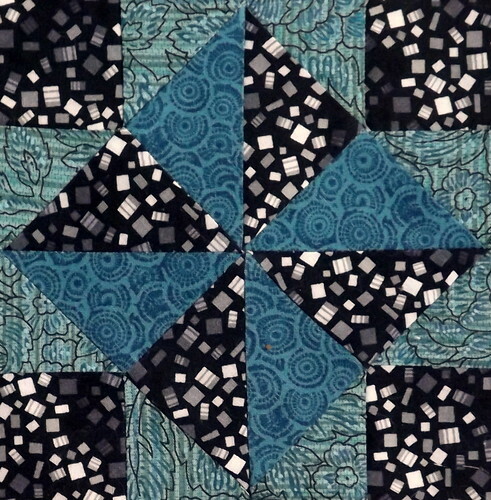 Maybe I’m nuts, but I just can’t help re-visiting some of these Farmer’s Wife blocks and wondering just what I was doing when I put certain fabrics together. Or where in the world I learned to measure an accurate 1/4″ seam, since some of the blocks just didn’t come out at the right sizes. But that’s what do-overs are for, right? Going back and making things better. I ended up using my pre-cut scraps for the re-do of Buzzard’s Roost. I think I’m now officially out of that black print, which is kind of sad. It was a favorite for a long time. I’m so much happier with Squash Blossom now that I’ve redone it! The first version was just too ‘meh’. 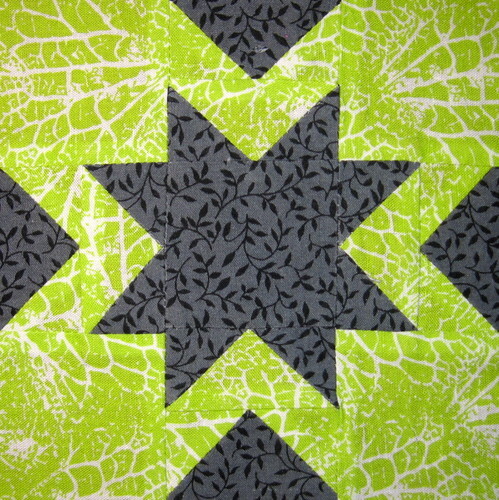 I attribute that to the really bland background fabric and the deep green print. Together, they’re just snooze-worthy. I decided to play around and use that pink plaid. That’s a print that I never expected to like so much. 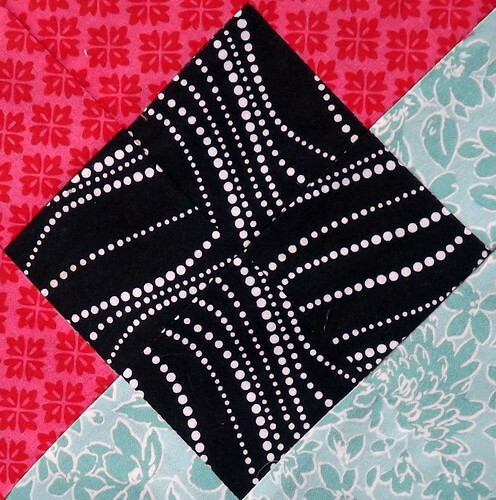 I actually meant for this block to be reversed – black for the ‘spider’, and the aqua for the background. Either way, very pleased. This time around, I remembered to alternate the direction in which the seams were ironed, making the final construction very easy. I was also conscious to pick thinner fabrics. I’ll have to remember both tricks when I’m ready to re-do Wood Lily. 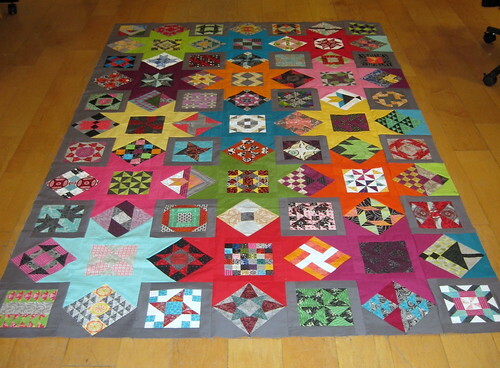 At this point, I’m done with seven of the fourteen blocks that need to be re-done. Yay! I’m going to try to get through Wood Lily and the replacement block for Flower Pot tonight. Yesterday, I was able to join Sandi at her house to sew – Grandma felt up to trying a day of watching kiddo. 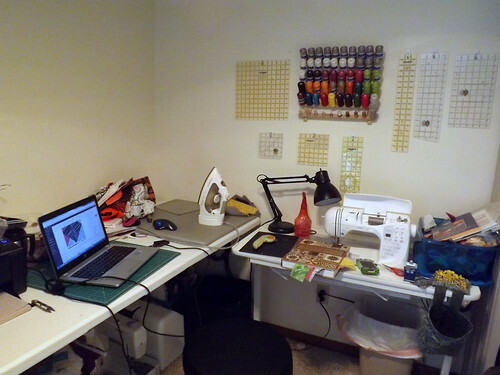 It was very nice to spend some unbroken time with the sewing machine! I need to iron it still, but I’m not worrying about that yet. As I go through these and do the re-makes, it’s more and more clear that I really lean toward the clear tones of colors. The more ‘muddy’ a print is, the less likely I am to really like it. 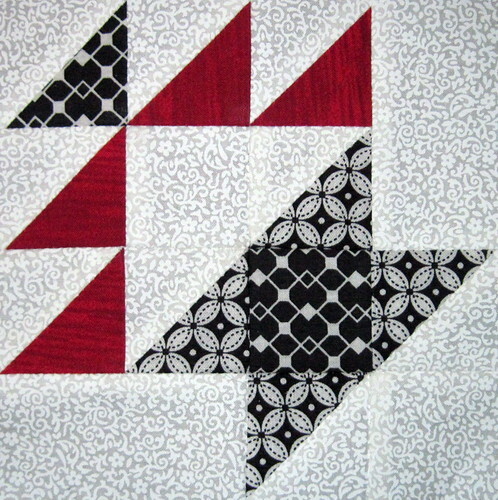 It’s also fun to see how much doing this sampler has pushed my piecing skills. I’m far more accurate now than I was when I started this project. Also fairly cool for me, I re-made these blocks from the scraps I cut down over this past week, so scrap management is working for me. At least a little. 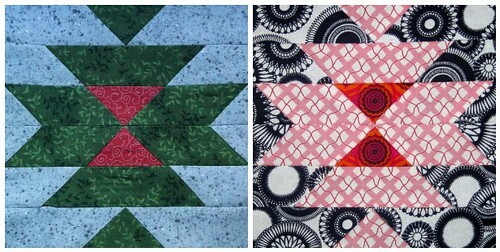 I decided on three more blocks that need re-doing. No big surprise there. I handle these blocks and just need to re-work some as i look at them. 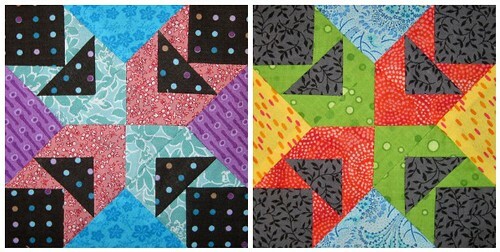 They’re either not in the colors that I would like, or they’re not up to my piecing standards. Now, I’ve got to put the kiddo down to bed. After that, I’m going to attempt to do a couple more re-makes before I have to hit the hay myself, to get through work all right tomorrow. Rather than attempt to sleep this cold off (which I should have been doing), I decided to start tackling the Farmer’s Wife Sampler again. Tonight was not a night to crawl around on the floor and decide what blocks should go where in the setting, so I worked on do-overs. Only two blocks done tonight, but the important thing is to keep moving, and not be discouraged, despite other activities that might take me away from sewing. Take, for instance, tomorrow. The plan is to hit the gym after work, and then come home and make dinner, all the while keeping kiddo entertained. As long as my sinuses have decided to stop trying to escape my face. 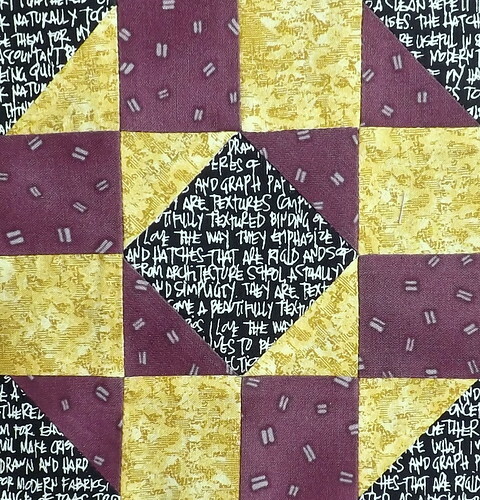 The imaginatively named ‘Basket’, taken from Jinny Beyer’s ‘The Quilter’s Album of Patchwork Patterns’, page 74, # 9. I am so done with basket blocks. So very done. And let’s not even comment on the fact that apparently my brain is trained to think of baskets in black, white, and red. Basket BOM, anyone? 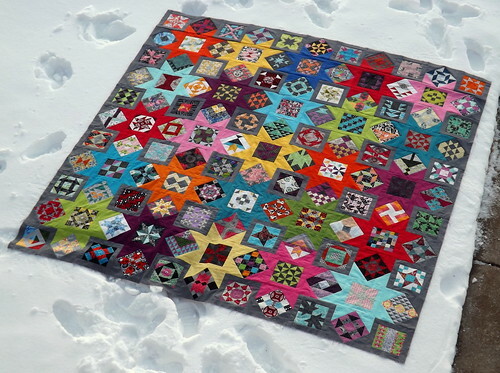 ‘Indian Hatchet’ – also taken from Jinny Beyer’s ‘The Quilter’s Album of Patchwork Patterns’, this time, page 74, # 7. Really, I just wanted a block to show off that grey print. Oh, and something that wasn’t a freaking basket block. Seriously, I might rage-quit the next project that decides to throw a freaking basket block at me. 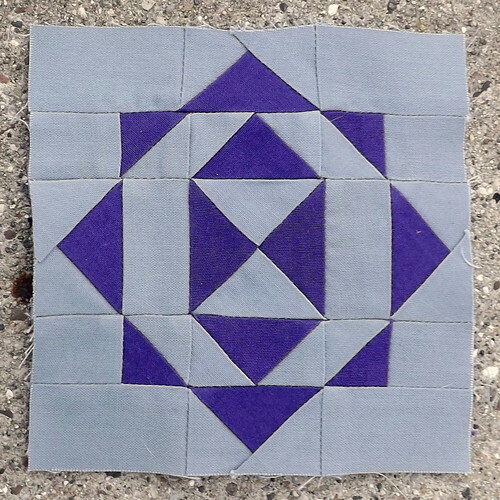 My goal for while I’m at lunch tomorrow now is to print the paper-piecing templates for the rest of the blocks that will need such. 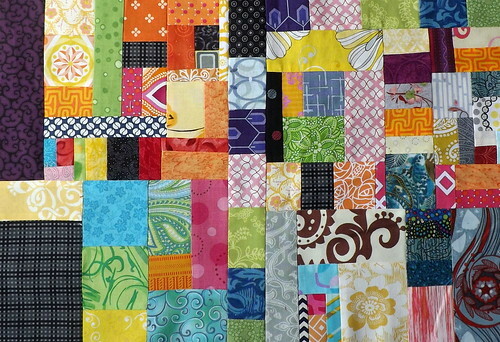 That way, after being a virtuous monkey tomorrow, I can indulge in some guilt-free sewing.